When people are new to owning livestock, they usually don’t want to have too many males. When I’m asked a question like, “Can I breed a buck (or ram or boar or whatever) to his daughter?” I usually say, you can do whatever you want, but you have to be ready to deal with the consequences. They say inbreeding livestock produces trash or treasure. Inbreeding concentrates genes. Are you concentrating awesome genes or defective genes? For example, does a buck have a lot of genes for excellent milk production, or does he have genes for extra teats or bow legs? This is why inbreeding should not be done simply because you want to avoid buying another male animal. The first doe I ever bought was accidentally bred when her son jumped the fence. Three of her four kids had teat defects. Even though she was an excellent milker, that meant that the males were all wethered and sold as pets, and the doeling was also sold as a pet without papers. All of your breeding decisions should be made with certain goals in mind — goals for improving your herd or flock. The only time I have purposely bred a parent to offspring was when I bred my best milker to her son. His sire had excellent milking genetics, so I was hoping to double up on that. Since the buck was already six years old, and I had never seen any disqualifying defects in any of his kids, I was not too worried about something like a teat defect, and there were none. When inbreeding happens — whether by accident or on purpose — you have to be prepared to make a responsible decision as a breeder, if one or more offspring has some type of defect. 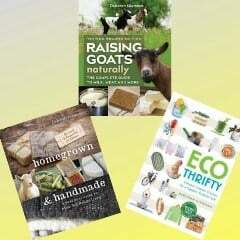 Do you have a pet market for the animals, if they are not breeding quality? Are you willing to butcher any animals that have a defect? Sometimes when people are breeding all animals for meat, such as in the case of pigs, they think that inbreeding is less important. After all, all offspring will be eaten. However, if you continue to inbreed generation after generation, litters will get smaller, and the size of the offspring may also get smaller. We had some accidental inbreeding with our sheep one year, and lambs grew so slowly that we could not butcher them in the fall like we usually do. That meant that we had to feed them hay through the winter, waiting for them to grow large enough to butcher. How close is too close when it comes to breeding related animals? The biggest risk of defects occurs when you are breeding first-degree relatives, such as father and daughter, mother and son, or full siblings because you are concentrating genes so much. When breeding a parent to a child, the parent’s genes will make up 75% of the offspring’s genetics. If the parent has any undesirable traits, they are more likely to come out. I know one breeder who will purposely breed a doe back to her sire whenever she buys a new buck so that she can immediately learn if he has anything undesirable in his genes. Basically, she’s trying to force out the bad genes, if they exist. If anything negative comes out, she culls the buck. 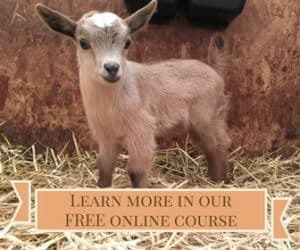 Other breeders don’t want to inbreed until they’ve used an animal for several years and feel confident that there is nothing negative lurking in the goat’s DNA. There is a joke that if the offspring are great, it’s line breeding, but if they’re bad, it’s inbreeding. (Unfortunately some people don’t realize this is a joke.) Line breeding generally means that you are breeding distantly related animals, but there isn’t any official percentage that separates line breeding and inbreeding. Most people would agree that breeding first degree relatives is inbreeding, but beyond that, it’s rather gray. The bottom line is that there are no guarantees about what type of offspring you will get when you breed two animals. 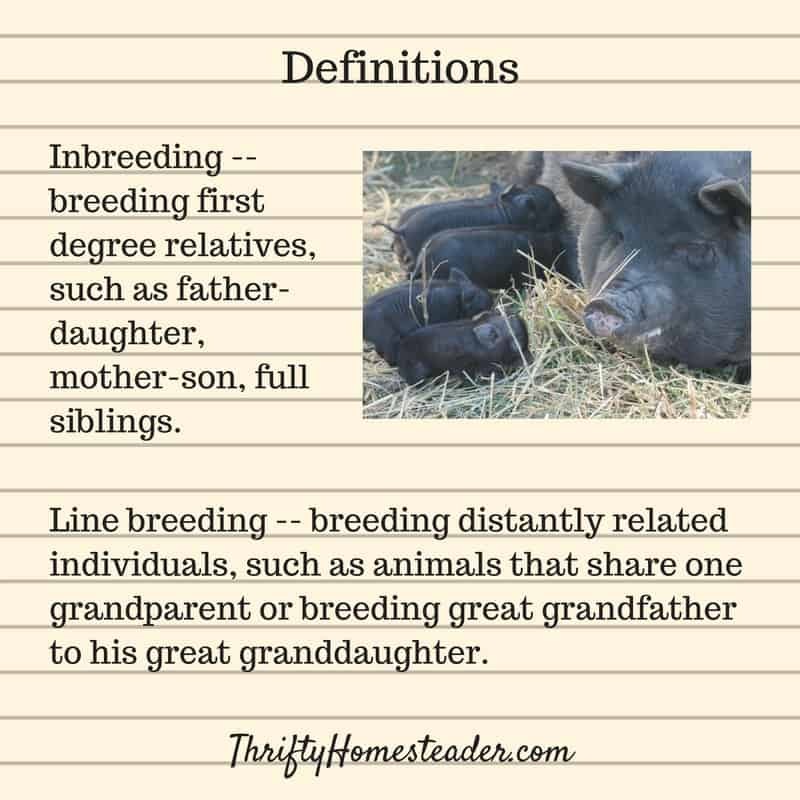 Like all breeding decisions, line breeding and inbreeding should be done with specific goals in mind to improve your herd or flock, not just because you don’t want to buy another male animal. Excellent explanation! I’ve also heard something like “If the offspring are good (desirable qualities and no defects) it’s called line breeding. If it doesn’t work it’s called inbreeding.” Kind of a backhanded slam against breeding very close relatives. If you are breeding for meat it doesn’t matter if you are inbreeding or line breeding. The offspring will not be bred they will be eaten. 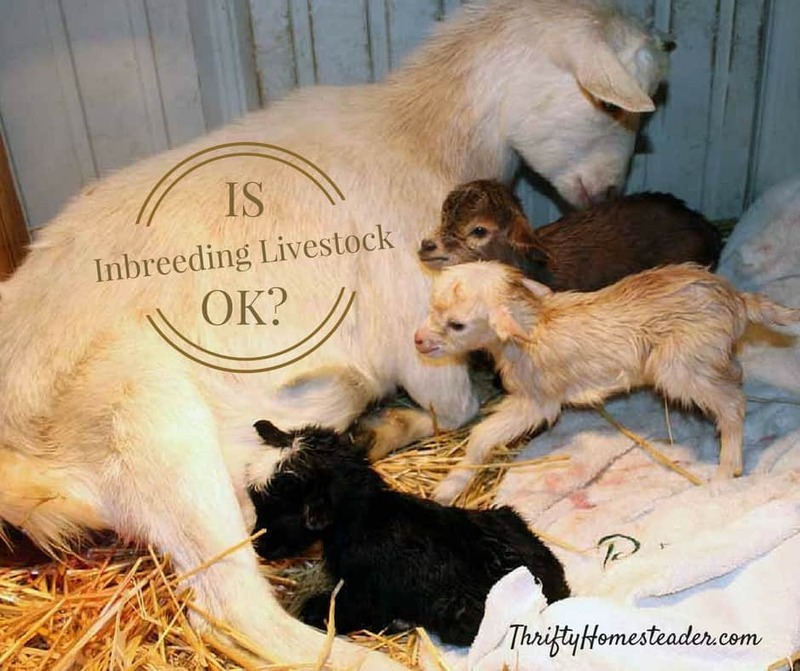 If you are breeding for replacement or sale as breeding stock it wouldn’t be a good idea. “The bottom line is that the more distantly related two goats are, the less likely the offspring will wind up with undesirable traits.” This is a pretty broad generalization, implying that animals with a higher COI (coefficient of inbreeding) are likely to be inferior. If you look around the country, you will see that many of the best herds in the country use inbreeding to set certain desirable characteristics firmly in their lines. If you are constantly outcrossing to completely unrelated animals, you are constantly throwing the dice as to what characteristics you’ll end up with. Using some inbreeding, you’re loading the dice. Using too much inbreeding, you start to see the effects of inbreeding depression such as reduced fertility and smaller litters. Avoiding inbreeding, you could be harboring serious recessive defects in your lines. With some inbreeding, those defects will become apparent, enabling you to remove the defects from your lines through culling. The real bottom line varies somewhat from that stated above: inbreeding can be a useful and valuable tool in achieving excellence, but only when it is done to a limited extend and by a knowledgeable breeder with definite goals in mind. As a farmer and a hunter, I have always asked questions about inbreeding farm animals because they say to avoid it on farms, but you know that wild animals have no one restricting them. However, wild animals seem to be fine. Most of them are healthy when conditions are right and good at surviving. I suspect that whether the female in the wild gets bred to a relative is hit or miss and whatever comes of it is the way it is and people do not notice the results. On the farm we notice. It is no worse to breed a parent/offspring than it is to breed two half siblings together. It is less ‘risky’ than breeding 2 full siblings together. It’s because the offspring only share half the genes with the parent, (the other half being ‘unique’ because they came from the other parent). Two full siblings will share the same potential mix because both parents are the same, so exactly the same potential genes at any given point.